The TL39 3-DoF motion simulator with IOS at Moscow Aviation Institute. A flight simulator is a system that tries to replicate, or simulate, the experience of flying an aircraft as closely and realistically as possible. The different types of flight simulators range from video games up to full-size cockpit replicas mounted on hydraulic (or electromechanical) actuators, controlled by state of the art computer technology. Flight simulators are extensively used by the aviation industry for design and development and for the training of pilots and other flight deck crew in both civil and military aircraft. Engineering flight simulators are also used by aerospace manufacturers for the development and testing of flight hardware, flight software, and aircraft systems. It is much safer to perform these tests on simulators than on aircraft in flight. Because powered flight is hazardous to attempt untrained, from the earliest days, various schemes were used to enable new pilots to get used to the controls of the plane without actually being airborne. For instance, the Sanders Teacher was a complete aircraft mounted on a universal joint and facing into the wind, able to rotate and tilt freely. Another early flight simulator of about 1910 was built using a section of a barrel mounted on a hoop. A number of electro-mechanical devices were tried during World War I and thereafter. The best-known was the Link Trainer, produced by Edwin Link in the U.S. and available from 1929. This had a pneumatic motion platform driven by bellows giving pitch, roll, and yaw, on which a replica generic cockpit was mounted. It was designed for the teaching of Instrument (cloud) flying in a less hazardous and less expensive environment than the aircraft. After a period, where not much interest was shown by professional aviation, the U.S. Army Air Force purchased four Link Trainers in 1934, after a series of fatal accidents in instrument flight. The world flight simulation industry was born. Some 10,000 Link Trainers were used in the 1939-45 war to train new pilots of allied nations. They were still in use in several Air Forces into the 1960s and early 1970s. The Celestial Navigation Trainer of 1941, was a massive structure 13.7 meter (m) (45 feet (ft)) high and capable of accommodating an entire bomber crew learning how to fly night missions. In the 1940s, analog computers were used to solve the equations of flight, resulting in the first electronic simulators. In 1948, Curtiss-Wright delivered a trainer for the Stratocruiser to Pan American, the first complete simulator owned by an airline. Although there was no motion modeling or visual display, the entire cockpit and instruments worked, and crews found it very effective. Full motion systems came in starting in the late 1950s. The early visual systems used an actual small model of the terrain. A camera was "flown" over the model terrain and the picture displayed to the pilot. The camera responded to pilot control actions and the display changed in response. Naturally only limited areas of the ground were able to be simulated in this manner, usually just the area around an airport or, in military simulators, typical terrain and sometimes targets. The use of digital computers for flight simulation began in the 1960s. In 1954, General Precision Inc., later part of Singer Corporation, developed a motion simulator which housed a cockpit within a metal framework. It provided 3 degrees (angle) of pitch, roll, and yaw, but by 1964, improved, compact versions increased this to 10 degrees angle. By 1969, airline simulators were developed where hydraulic actuators controlled each axis of motion, and simulators began to be built with six degrees of freedom (roll, pitch, yaw for angular motion and surge, heave and sway for longitudinal, vertical and lateral translation). Starting in 1977, airline simulators began adopting the modern "cab" configuration where computers are placed in the cockpit area (rather than in off-simulator racks), and equipment is accessed via a wraparound catwalk when the simulator motion system is inoperative. Around this time, great strides were also made in display technology. In 1972, Singer developed a collimating lens apparatus, using a curved mirror and beamsplitter, which projected Out of The cockpit Window (OTW) views to the pilot at a distant focus. These collimated monitors greatly improved the realism of flight simulation. However, each monitor only offered a field of view of 28 degrees and several were needed for a realistic field of view. In 1976, wider angle collimated monitors were introduced, co-called "WAC windows," standing for "Wide Angle Collimated." Finally, in 1982, the Rediffusion company of Crawley, UK, introduced the Wide-angle Infinity Display Equipment (WIDE) that used a curved mirror of large horizontal extent to allow distant-focus (collimated) viewing by side-by-side pilots in a seamless display. Various categories of flight simulators and flight training devices are used for pilot training. These vary from relatively simple Part-Task Trainers (PTTs) that cover one or more aircraft systems, Cockpit Procedures Trainers (CPT) for practicing drills and checks, to so-called Full Flight Simulators (FFS). The higher levels of Full Flight Simulators have motion platforms capable of moving in all six degrees-of-freedom (6-DoF). They also have wide-angle high-fidelity collimated visual systems for displaying the outside world to the pilots under training. The simulator cabin containing the replica cockpit and visual system is mounted on a six-jack motion platform that, by moving the platform jacks under computer control, gives the three linear movements and the three rotations that a freely moving body can experience. The three rotations are Pitch (nose up and down), Roll (one wing up, the other wing down), and Yaw (nose left and right). The three linear movements have a number of names depending on the area of engineering involved but in simulation they are called Heave (up and down), Sway (sideways left and right), and Surge (longitudinal acceleration and deceleration). Flight simulators are used to train flight crews in normal and emergency operating procedures. Using simulators, pilots are able to train for situations that are unsafe in the aircraft itself. These situations include engine failures and failures or malfunctions of aircraft systems such as electrics, hydraulics, pressurization, flight instruments, and so forth. National Aviation Authorities (NAA) for civil aircraft such as the U.S. Federal Aviation Administration (FAA) and the European Aviation Safety Agency (EASA), certify each category of simulators and test individual simulators within the approved categories. U.S. commercial pilots can only log required training time in simulators that are certified by the FAA and European pilots in simulators approved by EASA. 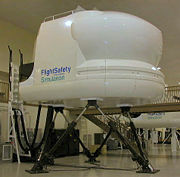 In order for a simulator to be officially certified, it must be able to demonstrate that its performance matches that of the airplane that is being simulated to the capacity required by the category of Flight Training Device (FTD) or Full Flight Simulator (FFS) to which it is designed and approved by the regulatory body. The testing requirements are detailed in test guides referred to as an Approval Test Guide (ATG) or Qualification Test Guide (QTG). Simulators are classified as Level 1-7 flight training devices (FTD) or Level A-D full-flight simulators. The highest, most capable device is the Level D Full Flight Simulator. This can be used for so-called Zero Flight Time (ZFT) conversions of already-experienced pilots from one type of aircraft to a type with similar characteristics. In ZFT conversions, no aircraft time is needed and the pilot first flies the aircraft, under close supervision by a Training Captain, on a revenue sortie. System trainers are used to teach pilots how to operate various aircraft systems. Once pilots become familiar with the aircraft systems, they will transition to cockpit procedures trainers or CPTs. These are fixed-base devices (no motion platform) and are exact replicas of the cockpit instruments, switches and other controls. They are used to train flight crews in checks and drills and are part of a hierarchy of flight training devices (FTD). The higher level FTDs are "mini simulators." Some may also be equipped with visual systems. However, FTDs do not have motion platforms and do not have the fidelity of the Full Flight Simulators. A full flight simulator (FFS) duplicates all aspects of the aircraft and its environment, including motion in all six degrees-of-freedom. Personnel in the simulator must wear seat belts as they do in the real aircraft. As the jack travel of any simulator is limited, the motion system employs what is called "acceleration onset cueing" that simulates initial accelerations well and then backs off the motion below the pilot's sensory threshold so that the jack limits are not exceeded. Manufacturers of civil Full Flight Simulators include FlightSafety International and Rockwell Collins in the U.S., CAE Inc. and Mechtronix in Canada, and Thales in France and the UK—the UK site being the ex-Rediffusion simulator factory at Crawley, near Gatwick airport. There are currently about 1200 Full Flight Simulators in operation worldwide, of which about 550 are in the U.S., 75 in the UK, 60 in China (PRC), 50 each in Germany and Japan, and 40 in France. Flight simulators are also extensively used for research in various aerospace subjects, particularly in flight dynamics and man-machine interaction (MMI). Both regular and purpose-built research simulators are employed. They range from the simplest ones, which resemble video games, to very specific and extremely expensive designs such as LAMARS, installed at Wright-Patterson Air Force Base, Ohio. This was built by Northrop for the Air Force Research Laboratory (AFRL) and features a large scale five degrees of freedom motion system to a unique design and a 360 degree dome-mounted visual system. Most simulators have Instructor Operating Stations (IOS). At the IOS, an instructor can quickly create any normal and abnormal condition in the simulated aircraft or in the simulated external environment. This can range from engine fires, malfunctioning landing gear, electrical faults, storms, downbursts, lightning, oncoming aircraft, slippery runways, navigational system failures, and countless other problems which the crew need to be familiar with and act upon. Many simulators allow the instructor to control the simulator from the cockpit, either from a console behind the pilot's seats, or, in some simulators, from the co-pilot's seat on sorties where a co-pilot is not being trained. In the past, full motion flight simulators had been limited to multi-million dollar hydraulic devices used at large training centers such as FlightSafety International, CAE and Alteon (a Boeing company). Recent advances in electric motion simulation bases have permitted full motion simulation to be utilized economically for much smaller aircraft including single-engine piston aircraft at training centers such as Flight Level Aviation. Flight simulators are an essential element in individual pilot as well as flight crew training. They save time, money, and lives. The cost of operating even an expensive Level D Full Flight Simulator is many times less than if the training was to be on the aircraft itself. High end commercial and military flight simulators incorporate motion bases to provide the most realistic simulation possible. The majority of these simulators rely on the venerable Stewart platform to generate motion. Using hydraulic cylinders, these systems provide reliable motion for many flight training scenarios. However, the Stewart platform has one primary drawback. This drawback is limited pitch, roll, and yaw. Motion bases using Stewart platforms typically max out at less than +/- 35 degrees of pitch or roll. Several companies are performing research and development on advanced motion platforms that will someday provide for increased amounts of pitch, roll, and yaw. AMST Systemtechnik (Austria) and TNO Human Factors (the Netherlands) are building the Desdemona flight simulation system. 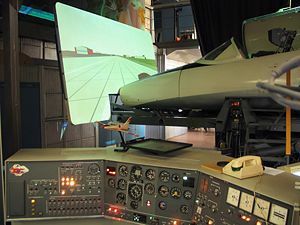 This large scale simulator provides unlimited rotation via a gimbaled cockpit. The gimbal sub-system is supported by a framework which adds vertical motion. Furthermore, this framework is mounted on a large rotating platform with an adjustable radius. The Desdemona simulator is designed to provide sustainable g-force simulation with unlimited rotational freedom. NASA's Ames Research Center operates the Vertical Motion Simulator. This is an advanced high fidelity motion platform with an impressive 60 ft of vertical range. An interchangeable cabin design permits quick switching between different aircraft simulations. Simulations have ranged from blimps to the space shuttle. Simulation Kinetics, Inc. is developing a simulator which uses a rotating spherical capsule. The basic concept of this design was first patented during WWII. A more recent example of this design is the Rotational Flight Simulator built and operated during the space race. This simulator capsule measures 3m (10ft) in diameter and weighs 2,903kg (6,400lbs). The Rotational Flight Simulator is now in storage at the USAF Museum of Aerospace Medicine at Brooks Air Force Base. Simulation Kinetics, Inc. is developing a new spherical capsule simulator named the Xenosphere This new prototype measures slightly under 2.4 m (8 ft) in diameter and is made of lightweight composites. This new simulator is designed to produce a combination of unlimited rotation with high levels of agility. Crude flight simulators were among the first types of programs to be developed for early personal computers. Bruce Artwick's subLOGIC simulators were well-known for the functionality they managed to get onto 8-bit machines. A popular type of flight simulator are combat flight simulators, which simulate combat air operations from the pilot and crew's point of view. Combat flight simulation titles are more numerous than civilian flight simulators due to variety of subject matter available and market demand. In the early 2000s, even home entertainment flight simulators had become so realistic that after the events of September 11, 2001, some journalists and experts speculated that the hijackers might have gained enough knowledge to steer a passenger airliner from packages such as Microsoft Flight Simulator. Microsoft, while rebutting such criticisms, delayed the release of the 2002 version of its hallmark simulator to delete the World Trade Center from its New York scenery and even supplied a patch to delete the towers retroactively from earlier versions of the sim. The advent of flight simulators as home video game entertainment has prompted many users to become "airplane designers" for these systems. As such, they may create both military or commercial airline airplanes, and they may even use names of real life airlines, as long as they don't make profits out of their designs. Many other home flight simulator users create their personal, virtual version of their favorite real world airline, and so virtual airlines such as Virtual Delta, Mexicana Virtual, Virtual Aeroflot, Viasa Virtual, UPSVAC[UPS Virtual Air Cargo], and so on can be found online. These modifications to a simulation (colloquially known as "mods") generally add much to a simulation and often grant a significantly expanded playing experience with new situations and content. In some cases, a simulation is taken much further in regards to its features than was intended, or even envisioned by its original developers. Falcon 4.0 is an excellent example of such modification; whole new war zones were added, along with the ability to fly hundreds of different aircraft, as opposed to the original single flyable airframe. In addition to actually flying in the game, many users have discovered "Online air traffic." This is when virtual pilots and virtual ATCs play together in real time to simulate a true air traffic experience. There are several networks, the most popular ones being VATSIM and IVAO. Aerowinx Precision Simulator, a high-level Boeing 747-400 simulator, made by Hardy Heinlin. Falcon 4.0 (and the newer Falcon 4.0: Allied Force), an extremely detailed "study sim" of the F-16 Fighting Falcon. Su-27 Flanker (game) contained a realistic and detailed flight model in a less competitive graphics shell on the PC. Lock On: Modern Air Combat, Jet Combat simulator. Much rarer but still notable are flight simulators available for various game consoles. The most notable of these were Pilotwings, made available for the Super Nintendo, the sequel Pilotwings 64 for the Nintendo 64 and the Ace Combat series on Playstation 1&2. The very rare Sky Odyssey is yet another example of console flight simulators. Due to the restrictive nature of a game console's ability to properly simulate environments in general and the processing limitations of these systems in particular, game console-based flight simulators tend to be simplistic and have a more "arcade"-like feel to them. While generally not as complex as PC based sims, console flight simulators can still be enjoyable to play, though their "simulation" status is disputed by many in the flight simulation community. As space is a natural extension of airspace, space flight simulators may be treated as an extension of flight simulators' genre. There is a considerable interdependence between those two kinds of simulators, as some flight simulators feature spacecraft as an extension and the other hand some space flight simulators may feature a pretty realistic atmospheric flight simulation engine. The Wings of Mercury, simulation of the Mercury spacecraft. In recent years, with the advent of cheap yet powerful personal computers, many people have taken to creating homebuilt simulators of a variety of aircraft, ranging from a few panels with a screen on top to full-blown motion simulators, with every switch and gauge reconstructed in fullsize. The main problem with homebuilt simulator systems is to find real software and hardware for GPS navigation that can also be used for pilot training and also interfaces with flight simulators. Some companies offer various software to help solve this problem. ↑ John G. Amery and Harry Streid, Flight simulation Visual Requirements and a New Display System, Rick Lee Photo. Retrieved July 17, 2007. ↑ Willem Bles, Desdemona: Advanced Disorientation Trainer. Retrieved July 17, 2007. ↑ Simlabs, Vertical Motion Simulator. Retrieved July 17, 2007. ↑ Steve Jones, A Five Minute Primer on Rotating Sphere Motion Simulators. Retrieved July 17, 2007. Black Magic and Gremlins. Analog Flight Simulations at NASA's Flight Research Center by Gene L. Waltman. This page was last modified on 13 April 2017, at 15:10.